We can do spot treatments on younger clients that have small patches of scarring. For acne scarring between the ages of 18 and 25 years $150 for 2 x 2 area. Consult with us for larger area. An electric skin needling device that looks like a pen uses tiny needles to create very fine micro tunnels in the skin. We use Dermapen that is a safer and more effective devise. Be aware of the cheaper Dermaroller versions that other professionals use and the Dermarollers you can purchase for at home use. (More detailed information is at the end on the difference between Automated Micro-needling Vs Derma-roller.) This stimulates the production of new collagen and elastin, which enhances the appearance of your skin. These tunnels also serve to allow better and quicker penetration of topical skin care products resulting in quicker and more effective skin rejuvenation. The best results of this treatment are obtained when it is combined with one of our skin care programs. The skin is cleansed and numbing cream is applied to lessen discomfort. For better results and more comfort, we use a collagen-stimulating product like hyaluronic acid or Apple stem cells during the procedure. The small, handheld, pen-like device has a sterile, disposable tip with 12 tiny needles. It pierces the skin in the area(s) to be treated. The inflammatory reaction of the skin is extremely short and fades significantly within hours from redness to pink that may last for 12 to 48 hours. We send you home with a Post treatment kit of 5 products to help speed up the healing process. We prefer you bring a hat if it’s sunny. We prefer you do not wear makeup or a sunblock until the next day after your skin starts healing. Beautiful Skin by Carmen charge only a flat fee for the face of $250. How many treatments do I need and how often can Micro Micro-Needling procedures be repeated? Micro-Needling can be safely repeated every 4-6 weeks until you achieve the desired results. For overall rejuvenation, we recommend starting with 3 treatments with a minimum separation time of 4 to 6 weeks between treatments. For scar reduction, an average of 3 to 6 treatments are recommended. The number of treatments required will depend on how each individual responds to the treatments, age, the extent of the damage to your skin and your specific treatment goals. This will all be discussed at the initial consultation. MicroNeedling can be used on all skin parts of the body (face, neck, trunk arms, legs, etc). Most people will begin to see results after the very first treatment. To ensure proper healing, we recommend not using any products containing alpha-hydroxy acids (AHAs), retinol or Retin-A for 3 to 7 days. We have found that the use of Retinols make your skin more sensitive. Therefore, we recommend that you to stop using all products that contains retinol at least 3 day to 7 days before treatment. Exposure to sun should also be avoided and a broad-spectrum UV sunblock should be used. You will be given specific instructions after the procedure. What are the side effects and risks of the Micro-Needling procedure? Micro-Needling can be safely performed on all skin types and all skin colors. As the epidermis and in particular pigment cells called melanocytes in the skin are left intact, there is minimal risk of pigment change or post inflammatory hyperpigmentation. 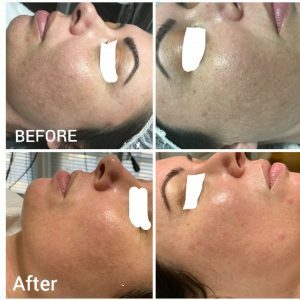 Skin MicroNeedling can treat sensitive and fragile areas that are difficult to treat with other procedures. These areas include the eyes, the neck and the back of the hands. Some patients often are confused and overwhelmed with the many different types of facial treatments available for them and the various information available online. A lot of patients find information on the internet saying that Automated Micro-Needling treatments are basically the same thing as derma-roller treatments. Patients first question when they see this is, why pay for a micro-needling treatment, when I can buy my own derma-roller? Essentially the two types of treatments have the same end goal, by stimulating the skin to produce its own collagen, preventing and reversing the signs of aging in a totally natural way. One of the biggest differences between the two treatments is the fact that the needles on a derma-roller do not penetrate the skin vertically. So whether you are using a derma-roller on a patient or yourself, the needles enter and exit the skin at an angle. The angle of the micro-needles can actually make tears in the skin and create a larger micro-channel than desired. When comparing the two treatments, the micro-needles of the Dermapen enter and exit the skin vertically. The micro-channels that are created with automated micro-needling are vertical, which is the desired result. The other main difference between the two treatments is the person actually performing the treatments. 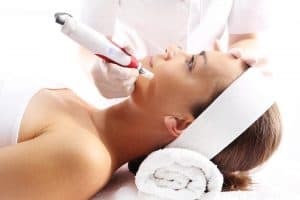 It always recommended to have a professional esthetician or dermatologist perform either treatments, but automated micro-needling devices are required to be used by licensed estheticians, registered nurses or doctors. There are many patients using derma-roller on themselves that can be dangerous and cause more damage than what you are trying correct. When a professional is performing micro-needling treatments they are trained to use it and they also use topical gels like Hyaluronic in combination with Stem Cell and Peptides to give the patient improved skin.